This year’s meeting of some 5,000 CAD specialists will be my fifth appearance at Solidworks World. I’m not sure that quite qualifies me as a veteran, but I certainly understand the form. I know my SWUGN from my CSWP; I could pick out Gian Paolo Bassi in a line up; and I’ve seen what happens when the beer runs out at a party full of thirsty engineers. I remember my first #SWW – San Diego 2014 – and being overwhelmed as well as somewat mystified by the pomp and fervour of proceedings. In the general sessions, ahead of which keen delegates queue up from the early hours of the morning to secure good seats at the Centre Court of 3D CAD, software tweaks are whooped to the rafters whilst a parade of Vice Presidents take the stage to a sound and light show that would put Pink Floyd’s stage manager to shame. To the cynical Brit unfresh off an 11 hour flight it was all rather, well, American. However, I soon realised the enthusiasm that abounds is a product of the passion of the Solidworks Community (drink every time you hear that sound bite mentioned and you’ll have a jolly time). It’s a group of users little short of evangelical about the software that is the staple of their professional lives. Delegates are eager to both hear from the corporate leadership about the company’s way forward and to share insights and techniques with peers from around the world. This year – as in 2017 – we are in Los Angeles. Of course, if something ain’t broke and all that, but we’re talking about a gathering of designers and mechanical engineers here – there’s got to be some changes. As such, the press room has moved down the corridor just to keep the journalists on their toes. I’m also delighted to report that after four solid days of very un-Californian drizzle twelve months ago, the weather this year looks set to be beautiful. Don’t be too jealous – I hope to enjoy a few snatches of sunshine outside of the air con of the convention centre. Solidworks World is far more than a software conference. The event’s programme switches rather charmingly between corporate strategy speeches, TED-style keynote presentations promising utopian futures, and parish notices singling out user groups, individuals, and educational programmes for a richly-deserved dose of applause. A concurrent technology exhibition is dedicated to the latest in product development kit. Major players and young upstarts in 3D printing, 3D scanning, and visualisation share the floor with big names in computing and data management. 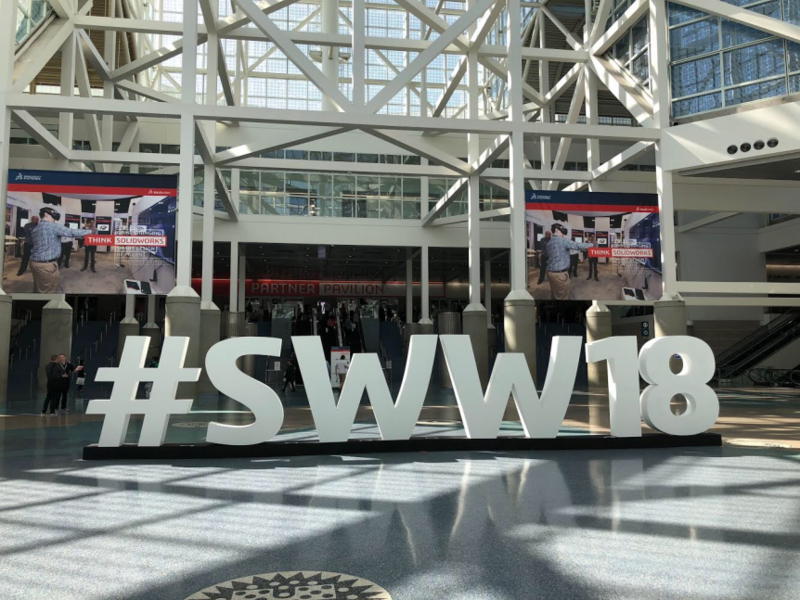 Over the coming days I hope to bring you a flavour of Solidworks World 2018 and keep readers abreast of the latest news from the convention stage and exhibition floor.